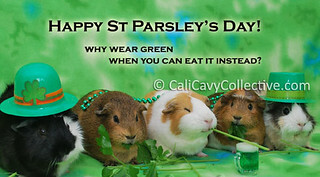 Happy St Parsley's - err, we mean Patrick's Day! 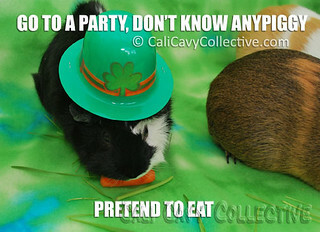 Whee pigs like to use this day as an excuse to celebrate all that is green and edible. 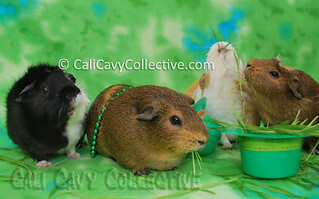 What could be a more appropriate day to pay tribute to all the hay, vegetables, fruits and grasses in a cavy's diet? Whee started off intending to have an intimate dinner party. Parsley, cilantro, wheatgrass, carrots and green parsley beer* were on the menu. Everything started off smoothly enough. Each of us were served our portions, and were more or less well accessorized for the occasion. The trouble started when after one too many parsley beers, certain piggies finished eating their carrots earlier than others and having done so, decided to embark on a mission to pilfer other pigs carrots by force. As with any St Parsley's Day, our organized little party quickly degenerated into a chaotic bar brawl after imbibing in one too many parsley beers. There were only so many baby carrots, bundles of wheatgrass and sprigs of parsley to go around. Having successfully managed to commandeer Peaches carrot, Belka consumed the spoils with glee while Peaches retaliated by thieving from the hapless Truffle. High pitched bickering ensued. It was every pig for herself! Judging by the outrage on Revy's face, there may or may not have been a few minor altercations over the hat filled with wheatgrass as well. Of course, everypiggy emerged unscathed and heftier than they had been prior to the start of the event. As you can guess, we piggies passed out in our pigloos afterwards. All in a good day's work! *Note: no actual beer or alcohol were given to or consumed by pigs. The tankard used above is a toy. 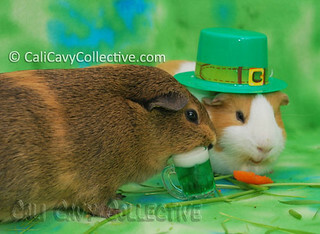 Please do not under any circumstances give your guinea pigs liquor as it is harmful to their health. Peaches has the best expressions!